The most popular book on cannabis that we ever sold at Polyester. Contains a wealth of information on all aspects of cultivation. This 2006 edition is vastly improved on the one published in the 1980's. 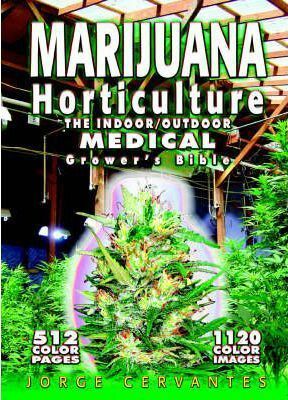 With 512 full color pages and 1120 full color photographs and illustrations, Marijuana Horticulture: the Indoor/Outdoor Medical Grower's Bible is the most complete cultivation book available. The Fifth Edition of the former Indoor Marijuana Horticulture: the Indoor Bible was originally published in 1983, when it immediately became a best seller. More than 500,000 copies of the Indoor Bible are in print in Dutch, English, French, German and Spanish. New greenhouse and outdoor growing chapters make this a book both indoor and outdoor growers will keep under thumb. The other 15 chapters (17 total) are all updated with the most current information, completely rewritten and significantly expanded. For example Dr. John McPartland contributed an all new medical section - The books credits list more than 300 contributors and reads like a who's who in the world of cannabis cultivation.